I currently have within my reach the sum of Forty-Two Million United States dollars…. Although you may think I’m a professional theatre reviewer (I’m not; I just love to share theatre with friends) or a Caltrans worker (I’m not; just a hobbiest highway historian), in real life I’m a cybersecurity expert (as I’ve recently written). It is rare to find a theatre offering that touches upon my field of expertise, so when I saw The Nigerian Spam Scam Scam (FB, non-HFF website) on the HFF schedule, I just had to get tickets. Nigerian Spam is one of those areas that people think never works, but it gets just enough of a response (when you’re sending out 10 million emails for free, even a fractional percentage response is great). If people are gullible enough to fall for the scam, they are gullible enough to click on malware links in email. That is literally the show. Two podiums and a digital projector. Dean Cameron (FB, IMDB) relates the story of how he baited along Nigerian spammers, with the ultimate goal of getting them to send him money. Co-star Victor Isaac (FB) provides the voices of the spammer side, from MRS MARIAM ABACHA to IBRAHIM ABACHA to DR DONALD ABAYOMI. The story itself is pretty much just condensed versions of the actual email dialogue, with hysterical side commentary and the occasional visual. In short, Cameron has done something all of us has wanted to do: lead along a spammer and get them caught up in the game. If you’re in the cybersecurity biz, you’ll find this hilarious (and a great demonstration that the spammers are no smarter than the great unwashed public). If you’re not in the cybersecurity biz, you’ll find this hilarious just for what Cameron got away with. This is just an hour or so of pure fun and humor. This show reminded me at bit of the recent musical, Loopholes, that we saw at the Hudson. In Loopholes, the authors took a real life absurd situation and turned into into a stage musical to highlight to the world the absurdity. It is similar in The Nigerian Spam Scam Scam: an absurd situation is presented on stage to highlight the absurdity of the interplay. Wisely, the authors of Nigerian decided to stay with the duologue route, eschewing the inherent musical possibilities. Although (I must note) to hear them talk, one never knows…. About my only complaint is that there is no program, so that there is no way to acknowledge the technical, support, and producing team. Mike Blaha is listed on the Fringe website, but his exact role (producer? director?) is not stated. 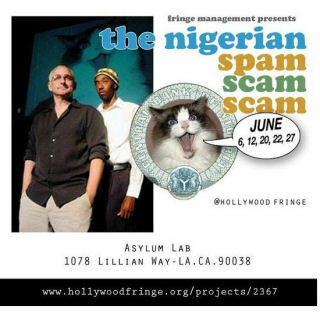 There are two performances left of The Nigerian Spam Scam Scam at the Fringe: June 22 (Monday) and June 27 (Saturday). If you can get tickets, go see it. If not, well, do you think we should book it as entertainment after the Conference Dinner? Ob. Disclaimer: I am not a trained theatre critic; I am, however, a regular theatre audience. I’ve been attending live theatre in Los Angeles since 1972; I’ve been writing up my thoughts on theatre (and the shows I see) since 2004. I do not have theatre training (I’m a computer security specialist), but have learned a lot about theatre over my many years of attending theatre and talking to talented professionals. I pay for all my tickets unless otherwise noted. I am not compensated by anyone for doing these writeups in any way, shape, or form. I subscribe at three theatres: REP East (FB), The Colony Theatre (FB), and Cabrillo Music Theatre (FB). Through my theatre attendance I have made friends with cast, crew, and producers, but I do strive to not let those relationships color my writing (with one exception: when writing up children’s production, I focus on the positive — one gains nothing except bad karma by raking a child over the coals). I believe in telling you about the shows I see to help you form your opinion; it is up to you to determine the weight you give my writeups. Upcoming Shows: Today the craziness continue with The Count of Monte Cristo – The Musical (FB) (HFF) at the Lounge Theatre (FB) in the afternoon, and Uncle Impossible’s Funtime Variety & Ice Cream Social, (HFF) at the Complex Theatres (FB) in the evening. The Fringe craziness ends with Medium Size Me, (HFF) at the Complex Theatres (FB) on Thursday 6/25 and Might As Well Live: Stories By Dorothy Parker (HFF) at the Complex Theatres (FB) on Saturday. June ends with our annual drum corps show in Riverside on Sunday. July begins with “Murder for Two” at the Geffen Playhouse (FB) on July 3rd, and “Matilda” at the Ahmanson Theatre (FB) on July 4th. July 11th brings “Jesus Christ Superstar” at REP East (FB). The following weekend brings “The History Boys” at the Stella Adler Theatre (FB) on Saturday (Goldstar), and “Green Grow The Lilacs” at Theatricum Botanicum (FB) on Sunday. July 25th brings “Lombardi” at the Lonny Chapman Group Rep (FB), with the annual Operaworks show the next day. August starts with “As You Like It” at Theatricum Botanicum (FB), and is followed by the summer Mus-ique show, and “The Fabulous Lipitones” at The Colony Theatre (FB). After that we’ll need a vacation! September right now is mostly open, with the only ticketed show being “The Diviners” at REP East (FB) and a hold-the-date for “First Date” at The La Mirada Theatre for the Performing Arts (FB). October will bring another Fringe Festival: the NoHo Fringe Festival (FB). October also has the following as ticketed or hold-the-dates: Kelrik Production (FB)’s Urinetown at the Monroe Forum Theatre (Hold for Sat 10/3); “Mrs. A. Lincoln” at The Colony Theatre (FB) (Ticketed for Sat 10/10); and “Damn Yankees” at Cabrillo Music Theatre (FB) (Ticketed for Sat 10/17). As always, I’m keeping my eyes open for interesting productions mentioned on sites such as Bitter-Lemons, and Musicals in LA, as well as productions I see on Goldstar, LA Stage Tix, Plays411. In Judaism, there is this concept of a midrash. A midrash tells the story between the lines; it explains the story that appears in the formal scripture by providing the back, side, and around story. Classic examples of midrashim include the story of Abraham smashing his father’s idols or the story of Lillith. Neither appear in the book of Genesis, but both are the explanations of the story that does appear. 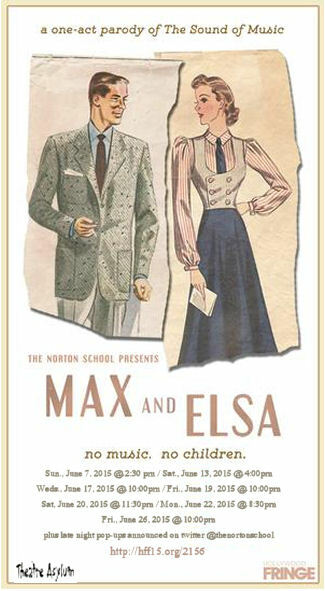 Yesterday, we saw our second 2015 Hollywood Fringe Festival (FB) show: Max and Elsa. No Kids. No Music. This show is a midrash on the Rodgers and Hammerstein musical The Sound of Music. It tells the back, interstitial, and after story of two minor characters: Max Detweiler (Clayton Farris (FB)) and Baroness Elsa Schraeder (Megan Rose Greene (FB)) during the times not portrayed on the stage. It begins with Max trying to find the right man for Elsa — a man who is wealthy enough that Max can sponge off of him as well as Elsa. Elsa is insistent that he not have kids, for she’s not the mothering type; however Max convinces her that Captain Georg Von Trapp (Frank Smith/FB) is the man for her. She’s unsure because of “all those kids”, but gives in. Max tells her not to worry; he’s hired this non-descript nun to watch over them. What Max doesn’t tell her is his new position: he’s a booking agent and he’s looking for acts. You know the rest of the visible story: how Georg and Elsa fell in love and got engaged, and how Maria and Georg fell in love and destroyed the engagement, creating a singing act in the process. What you don’t know (and what this story shows) is how Max engineering the whole thing, including getting Maria to storm off and return. He even engineered their escape, and got arrested for it… which brought Max and Elsa back to where they were: trying to find the right man for Elsa. The story itself was very amusing and laugh-out-loud funny at many points. The authors of this production, Mason Flink (FB) and Lindsay Kerns (FB), came up with a wonderful backstory for these characters — a backstory that meshes well with our memories of the characters. Under the direction of Flink (FB), Max is clearly a man obsessed with, and out for, … Max. His philosophy is to move in whatever direction advances the cause of Max, and provides Max with the ability to live large on someone else’s nickle. Elsa is that Baroness we see in the movies: cold and calculating, uncomfortable around children and music, strongly wanting someone with particular qualities — the ability to support her parties and her lifestyle, and keep up with her. Clayton Farris (FB) (Max) and Megan Rose Greene (FB) (Elsa) did a wonderful job of creating and projecting these character traits. They worked well together and had a strong chemistry and humor. They also rolled wonderfully with the unpredictable beast that is live theatre: Elsa when the cap to her fountain pen just wouldn’t cooperate, and the both of them when Max slipped up and talked about the escape to Austria (no, Switzerland). What adds to the humor in this production is the character that Flink (FB) created for Capt Von Trapp. As portrayed wonderfully by Frank Smith/FB, Von Trapp was a dim bulb who couldn’t even remember the names of all his children, didn’t want them to sing, and pretty much allowed himself to be manipulated by whomever was around him. His only passion was for Austria. The dim nature of Von Trapp, combined with Elsa’s cynical dislike for both children and music (with a mixture of Max’s self-obsession) combined to create wonderful comedy. Supporting these three characters was Matthew Gilmore (FB) as both Rolf Gruber, Liesl’s 17 (going on 18) boyfriend, and the Mother Abbess. These side portrayals were hilarious. On the technical side, the set design by Lindsay Kerns (FB) was simple: some boxes, photos, tables, etc. They worked just well enough to establish the requisite place and time. The sound design by Alysha Bermudez (FB) worked well, particularly the sound effect of the children and the interstitial music (musical echos of The Sound of Music‘s music, composed and whistled by Mason Flink (FB)). Brandon Baruch (FB)’s lighting design illuminated the action, but due to Fringe limitations couldn’t do that much more. The costume design by Megan Rose Greene (FB) worked well: Elsa’s costumes gave off a wonderful sense of elegance and warmth; Max’s were suitably eccentric, and Georg’s had that echo of Austrian military. Rolf and the Mother Abbess were… inspired. Lastly, Jean Ansolabehere (FB) was the stage manager and coordinated props. Max and Elsa. No Music. No Children. has five more performances, all of which are supposedly sold out. They will also supposedly be adding more pop-up performances (which will be announced on Twitter @thenortonschool). If you can get tickets, the show is well worth seeing. Ancillary Notes. Be forewarned that parking may be horrible. We hunted in the area for ½ hour before giving up and paying $10 for the valet at the Dragonfly — the supposed Fringe central. This left us in a poor mood, which luckily the show brightened considerably. Alas, the good mood from the show was destroyed by the customer service problem we ran into at Fringe central afterward, but restored somewhat by our excellent evening show, Wombat Man: The Cereal Murders. None of this is the fault of Max or Elsa, which is why this is an ancillary note. Ob. Disclaimer: I am not a trained theatre critic; I am, however, a regular theatre audience. I’ve been attending live theatre in Los Angeles since 1972; I’ve been writing up my thoughts on theatre (and the shows I see) since 2004. I do not have theatre training (I’m a computer security specialist), but have learned a lot about theatre over my many years of attending theatre and talking to talented professionals. I pay for all my tickets unless otherwise noted. I am not compensated by anyone for doing these writeups in any way, shape, or form. I believe in telling you about the shows I see to help you form your opinion; it is up to you to determine the weight you give my writeups. Upcoming Shows: This afternoon brings Marry Me a Little (HFF) by Good People Theatre (FB) at the Lillian Theatre (FB). Next weekend sees the craziness continue with the Nigerian Spam Scam Scam (HFF) at Theatre Asylum (FB) and Merely Players (HFF) at the Lounge Theatre (FB) on Saturday, and (on Sunday) The Count of Monte Cristo – The Musical (FB) (HFF) at the Lounge Theatre (FB) in the afternoon, and Uncle Impossible’s Funtime Variety & Ice Cream Social, (HFF) at the Complex Theatres (FB) in the evening. The Fringe craziness ends with Medium Size Me, (HFF) at the Complex Theatres (FB) on Thursday 6/25 and Might As Well Live: Stories By Dorothy Parker (HFF) at the Complex Theatres (FB) on Saturday. June ends with our annual drum corps show in Riverside on Sunday. July begins with “Murder for Two” at the Geffen Playhouse (FB) on July 3rd, and “Matilda” at the Ahmanson Theatre (FB) on July 4th. July 11th brings “Jesus Christ Superstar” at REP East (FB). The following weekend brings “The History Boys” at the Stella Adler Theatre (FB) on Saturday (Goldstar), and “Green Grow The Lilacs” at Theatricum Botanicum (FB) on Sunday. July 25th brings “Lombardi” at the Lonny Chapman Group Rep (FB), with the annual Operaworks show the next day. August starts with “As You Like It” at Theatricum Botanicum (FB), and is followed by the summer Mus-ique show, and “The Fabulous Lipitones” at The Colony Theatre (FB). After that we’ll need a vacation! As always, I’m keeping my eyes open for interesting productions mentioned on sites such as Bitter-Lemons, and Musicals in LA, as well as productions I see on Goldstar, LA Stage Tix, Plays411.